Elegant and functional, this superb centerpiece is crafted by hand and celebrates the heart of Italian cities: the piazza. Exquisitely made of ceramic, this piece features a square portico with low arches that frame a spacious centre that can serve as a display surface. The ceramic's pure white character is highlighted with luxurious 24-karat gold for a stunning visual effect. The minimalist design and the classical references of the silhouette make this a timeless addition to any decor, where it can be combined with other objects from the same collection. 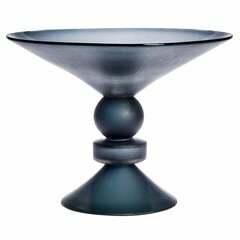 Large footed bowl made out of handblown glass with battuto cut surface by British glass artist Simon Moore. 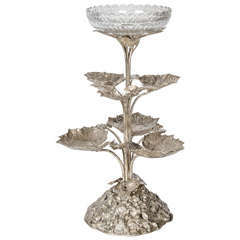 A silver plated Victorian centrepiece formed of three layers of leaves with stylised rock base and a Victorian cut crystal epergne bowl. White porcelain centrepiece bowl / compote with gold decoration by Ugo Zaccagnini. Italy, circa 1930. Signed. Bambous Tors baccarat crystal centrepiece. Etched baccarat mark on back. Four pieces. Excellent condition, circa 1915. 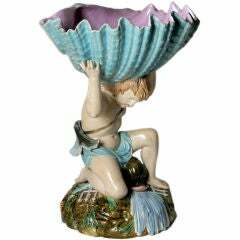 Large George Jones Majolica centrepiece with a kneeling Neptune figure over a dolphin while supporting a large turquoise shell over his head. Pattern #3320.